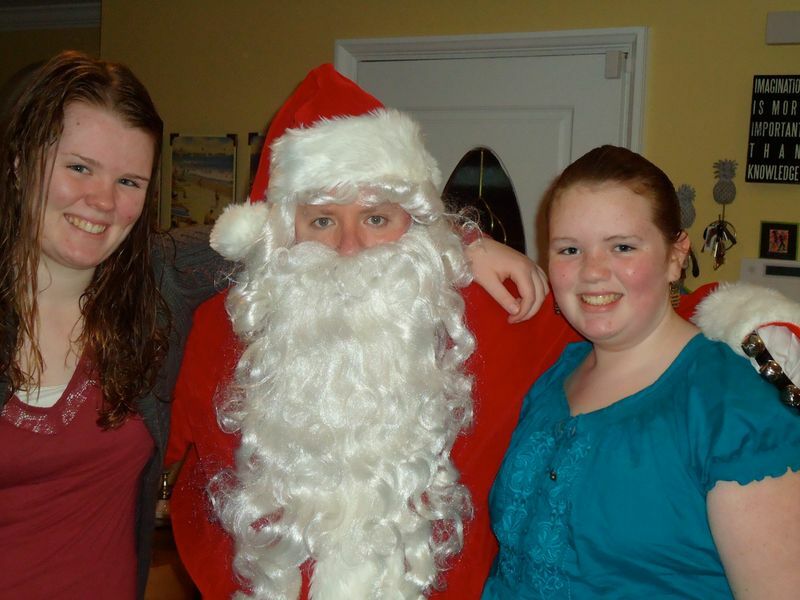 Santa Mike, flanked by his two daughters Annie and Maura. I remember the day I no longer believed in Santa. The cheapness of the suit probably had something to do with it -- not so much a Santa suit but more like a red plastic garbage bag that ol' St. Nick might wear to an Occupy Wall Street rally. He tried gamely at a jolly laugh, but after I smelled his favorite Velamints that wafted from the gauzy white beard and looked into those familiar, kind, rheumy eyes, I knew then and there that I was staring my dear old Uncle Buddy in the face. I was heartbroken. I just stared at the feet in my Batman pajamas, scarcely able to play along for the sake of my toddler brother. Buddy shrugged his shoulders, winked, and hobbled down the stairs. The whole experience left me putting two and two together. So, what else had my parents lied about? Easter Bunny? Tooth Fairy? Farrah Fawcett Majors was waiting to be Farrah Farragher if only I did my homework? The holiday was curdling like buttermilk into the Christmas of contempt. That moment probably gave birth to the Super Santa that I am today, and I say a prayer for the kind soul of Uncle Buddy as I fit the elastic straps of the white beard around my ears for a photo shoot with the newest member of my family. You gonna stop believing in something because you saw a faux St. Nick phoning it in? Not on my watch! This is my favorite season because it's a time when being happy and fat like me work to your full advantage. And let me tell you, I put my back into being Santa, people! I need less and less padding nowadays to fill the big red suit, which, by the way, cost me hundreds of dollars. My red cheeks match the cottony beard perfectly, though I pack rouge just in case. I won't work a room until I've cased it first, looking for the most dramatic entry and exit points. Naughty and nice lists along with the present request form should be sent to my secretary no less than a week in advance so that I can speak to Juniors Mints highlights and low-lights for the year. Heck, I even pack Snickers and Raisinets that get spread on the front step to simulate reindeer poop. My Ho Ho Hos shake the walls! If your kid gets freaked out by the volume, tough luck! Santa tones it down for no one! For every kid that loses it on my lap, there are a dozen that look at me with that dewey-eyed holiday wonderment that only a child can do. It melts my heart every time. Those are the ones that make it all worthwhile. They believe in the myth. They believe in Santa, and I owe it to them to be a full frontal Santa. When a child is cocooned on your red velvet lap and pulling on your pillowy beard, they reveal themselves in new ways. Sure, they ask for the hot toy of the year. But now, they ask you for some other things ever since Hurricane Sandy hit. They ask to be moved out of the hotel room they've been calling home for the last few weeks, ever since the storm claimed their home. They ask for a replacement of the comic book collection that got washed out to sea. They ask for your help to stop the arguing between Mom and Dad, whose nerves are frayed by the pressures of their newfound homelessness. They ask for simple things -- hats, coats, gloves, shoes, a roof, access to their first floor, blankets, sanity, normalcy, hope. This Santa just nods and assures the child that things will get better. Santa doesn't BS the child, mind you. Santa knows that he has a column in the Irish Voice and on our sister website Irish Central, and can appeal to our generous readers to donate their prayers and pennies to the folks that lost so much. Let's give those kids a reason to believe in Santa. God bless.